It is common practice that we meditate inside. Whether it be in our bedroom, yoga studio or the office break room, we are often meditating while surrounded by four walls and a ceiling. With the summer in full spring, why not take your practice outdoors? At the Centre, our staff and volunteers meditate together weekly in our meditation studios. It is an important part of our work week that enables us to be with what is present, and to make healthy choices in our work and personal lives. With this simple, mindful insight, we have since been enjoying our sunny summer meditation sits outside, taking a break from our desks, and shifting to the great outdoors. We invite you to do the same and we would like to offer you “The Sitting Sun” meditation which you can practice in your backyard, at the park or wherever comfortable where the sun shines on you. We often use the concepts of mindfulness and awareness interchangeably. Yet, they are not actually identical. You can be aware that the sun is shining on you, but that doesn’t mean you are being mindfully aware of it, noticing your moment-to-moment, body and mind experience. When practicing “The Sitting Sun Meditation”, make the sun your focal point of attention by experiencing body sensations from the sun shining on you. 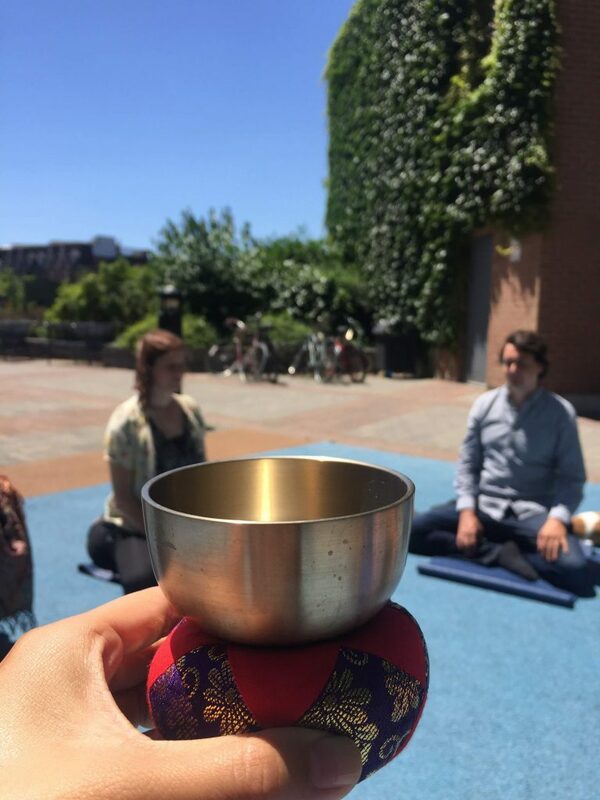 We hope you enjoy this meditation, and enjoy your summer wherever you are! Finding a sunny spot. Find a place that is comfortable and where the sunlight exposure is OK to be in for a period of time (maybe wear some sunscreen). It can be a good option to find a spot that has a mix of shade and sunlight if it is a particularly hot day. Taking your seat. Whatever you’re sitting on— be it a chair, a meditation cushion, or a park bench—find a spot that gives you stable and solid support, not cause your back to perch or hang. Bringing attention to the body. Noticing the body, having an open and receptive stance to any sensations that are present. If there are none, knowing that this is OK and just being with the experience of not noticing sensations. Attending to sunlight sensations. Bringing attention to any sensations from the sunlight on the body. Noticing qualities of these sensations such as temperature, tingling, pressure… whatever it is in that very moment. Acknowledging the air quality from its contact with the body such as dryness, humidity, a breeze. Also, feeling out where the sun is in the sky, based on the sun rays on the body. You do not have to think about where it is in the sky, but just sensing it moment-to-moment. If you do find that you are in thought, noticing this, and gently coming back to the sensations of sunlight. Expanding to sensations of sound. 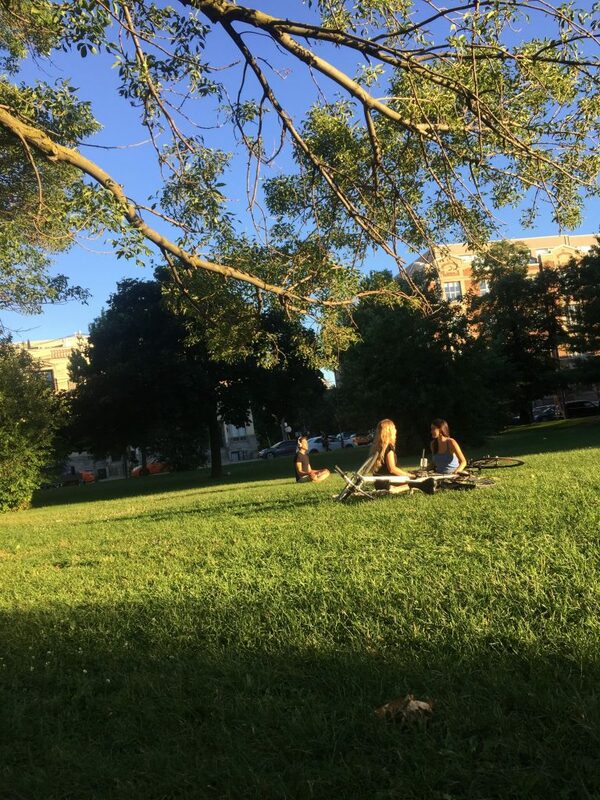 With an outdoor meditation, there is the likelihood of sounds of the street, wildlife, plants, crowds, wooshing…opening your ears to the soundscape. You do not have to go out searching for sounds, just observing them as they come and go. Offering Gratitude to the sun. The sun is something that we often take for granted. Taking a moment to be grateful for its presence and what it does for us every day. Bringing life to the earth by nourishing the plants, animals and ourselves.